Tesla Motors (s TSLA) has hit its scaled-back production and delivery goals of its Model S electric car. The company said Monday that it has achieved an annual production rate of 10,000 cars per year, or 200 cars per week, and delivered 250 Model S cars after producing nearly 350 of them for the third quarter. Back in July, executives at the electric car company had expected to ship about 500 Model S cars in the third quarter and 5,000 overall in 2012. In September, Tesla acknowledged that it was lowering that goal to making 300 cars and delivering 200 to 225 because it was four to five weeks behind schedule. Tesla has had no problem attracting reservations for the Model S, its second model and one that it hopes will generate profits, but it needs to crank up its factory to mass produce the car. Tesla CEO, Elon Musk, said back in July that the company’s pace of producing Model S should hit 20,000 per year by the end of 2012, and on Monday he said the company should hit that milestone in the next four to five weeks. 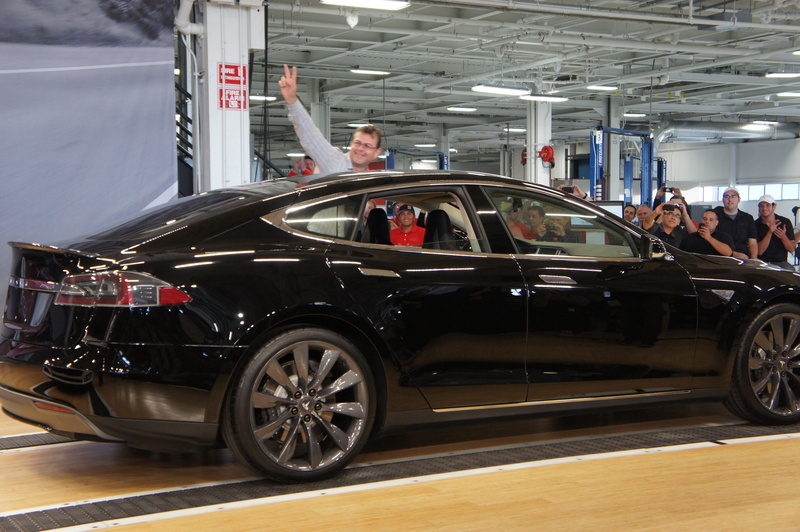 The company, which delivered the first Model S in June this year, now expects to deliver 2,500 to 3,000 Model S in the fourth quarter and over 20,000 in 2013. “Several months ago, I said that the coming several months will be a test for Tesla as it goes through the valley of death. I feel as though we’ve made it through that valley at this point,” Musk told analysts during a conference call about the company’s third-quarter earnings on Monday. The company’s first model was a luxury sports car called the Roadster that costs over $100,000. The Model S starts at $57,400 (without counting the $7,500 federal tax credit). Tesla went public in 2010. As a young carmaker, it’s not surprising to see Tesla running into manufacturing challenges, which include correcting mistakes in cars that just rolled off the assembly line and changing component suppliers. And that was the basis of some questions from analysts during the conference call. Musk said most newly built cars require some work to correct “minor issues,” including ones that involve the aesthetics of the car, and said those issues aren’t something average consumers would notice. He added that he was not aware of any supplier issue that would prevent the company from getting to the annual production rate of 20,000 cars. “We are seeing a rapid decline in the number of issues that needed to be corrected from vehicles coming off the line,” Musk said. How well the company can manage the expectations of investors and the public also will be critical for the performance of its stock, which rose over 8 percent to $31.31 per share in recent trading. Revenue: $50.1 million, up from $26.7 million in the second quarter but down from $57.7 million from the year-ago period. Losses: $111 million, or $1.05 per share, compared with $105.6 million, or $1 per share in the second quarter and $65.1 million, or $0.63 per share, from the year-ago period. Roadster update: Tesla shipped 68 Roadsters in the third quarter and expects to do “a decent business” selling used Roadsters now that the car has been out for a few years, Musk said. Tesla has a staff dedicated to managing the used Roaster business. Retail operation: The number of showrooms and service centers in the U.S. grew by 30 percent during the third quarter. The showrooms — and word of mouth from satisfied customers — are primary ways for Tesla to publicize its cars. The company doesn’t spend money on advertising. Tesla also plans to use the reservation system to sell cars for a while versus selling a car on the spot to anyone who walks into its showroom. Model S cancellation: Now that Tesla has started Model S delivery, it’s telling customers who signed up early on to convert their reservations to non-refundable orders. That has caused some customers to drop out. The cancellation rate for those who have been contacted by Tesla is about 10-15 percent, said Tesla’s CFO, Deepak Ahuja. The company had over 13,200 reservations in the third quarter. 200 cars per week = $1,000,000+. That will go a long way to balancing the ledger. I think they are fine; they need to stay focused on getting the line running smoothly and reducing the “minor issues”. As a startup technology company Tesla is intriguing, as a manufacturing company these numbers stink. Shelby built cars quicker. They need to bring in some old school car builders that know something about mass production and kick this gig into gear. We are all pulling for them but this is not how you grow a car company. They want to do this right. Any misstep ala Fisker and we all can kiss Tesla and possibly the electric car goodbye. Huge fan of Elon Musk and Tesla. However I didn’t realize that they were operating on a consistent loss of $100M+ a quarter. I am assuming they have a strategy to get this loss down each year? Is this the expected loss during the ramp up of their factories and showrooms? I also wonder if they are running into Patent issues since there are so many car companies that have been around much longer and they have large Patent portfolios regarding automotive manufacturing. I understand that their cars are innovative, but still I wouldn’t be surprised if the patent clerks allowed Toyota or someone to patent “4 wheels that simultaneously touch an underlying surfacewhile in motion or at a standstill”. Tesla is in a serious scale-up mode, so its expenditure will be much greater than the income. The strategy is to sell a lot of Model S and clear a profit. It’s got development contracts with other automakers, but selling lots of its own electric cars is the key to profitability.